Congress approved an appropriations bill on Dec. 18 to fund the government through 2016, but failed to include a measure that would have restored postal service standards to their pre-January 2015 levels. The primary purpose of an appropriations bill is to fund the government, but budget bills are often amended to include policy provisions, also known as “riders.” Congressional Republicans added several riders to the spending bill, including a measure lifting a ban on oil exports and a rule repealing country-of-origin meat labeling. What the bill fails to address, however, is America’s growing epidemic of delayed mail. Since the Postal Service cut service standards in January 2015, America’s once prompt mail delivery has fallen off a cliff. Citizens and businesses alike are feeling the sting as bill payments, medicine, newspapers and absentee ballots have been significantly delayed. Even the Postal Service’s own performance data shows the same sad truth. Degrading service standards has virtually eliminated overnight mail delivery and has resulted in a dramatic increase in delays to America’s mail. The U.S. Government Accountability Office (GAO), the Postal Regulatory Commission (PRC) and the USPS Office of Inspector General have all raised serious concerns about the negative impact on postal customers and on postal revenue. Congress’s failure to include language in the appropriations bill to ensure prompt reliable mail service threatens the future of America’s public Postal Service and is a dereliction of its duty to the American people. Over the course of the year, many in Congress have taken a stand against delayed mail. By a vote of 85-11 in April, the Senate approved a non-binding resolution by Sen. Bernie Sanders (I-VT) that called for a halt to the closure of mail processing plants, restoration of overnight mail standards, and protection of rural services. A majority of House members – 226 representatives –co-sponsored House Resolution 54, which calls on the Postal Service to restore overnight mail standards. The non-binding resolution, which was introduced by Rep. David McKinley (R-WV) and Rep. Paul Tonko (D-NY), enjoys bipartisan support. The House Appropriations Committeeapproved a bipartisan amendment to the bill that would have restored the mail service standards that were in effect before the January 2015 cuts. When drafting the final bill, however, congressional leaders failed to include it. Some opponents in the Senate took the position that restoring service standards would cost the government $300 million and that money was not available. That is simply not correct. The House Budget Committee did not count restoring USPS service standards toward appropriation bill allocations because the Postal Service is “off budget,” and by Congress’s own budget bill instructions, off-budget items do not count towards appropriation bill allocations. Not only is the USPS off budget, it is self-funding. The almost $70 billion used to operate the USPS comes from selling stamps – not tax money. Slowing down the mail in a fast paced world is a disastrous plan for the USPS. While Congress failed to act, the drive to keep the “service” in the Postal Service continues unabated. The growing complaints from individuals and businesses about the damaging effects of delayed mail will continue to be heard. In the ongoing effort to undo the Postal Service’s wrong-headed cuts, the activism of APWU members, retirees, Auxiliary, and allies have been outstanding. The APWU will continue to work with our allies and all members of Congress who want a robust Postal Service that provides prompt reliable mail service for all Americans. This is great news for Americans throughout the country and for the millions of businesses that rely on a strong Postal Service. The continuing rise in both letter and package revenue—and now even in overall mail volume—is leading to growing revenue. This is a time to strengthen—not degrade—the now-profitable networks. Nevertheless, massive cuts and closures of post offices and mail processing plants continue. As of Feb. 6th, the USPS POStplan has eliminated 13,000 full-time postmaster jobs in the past two years, as a result of cuts of 25% to 75% in hours of service at half our rural post offices. Tens of thousands of mail processing jobs have also gone away as 141 plants were “consolidated,” resulting in mail delays. The Postmaster General ordered the USPS to lower “service standards” on January 5th, to virtually eliminate overnight delivery – including first-class mail from one address to another within the same city or town. All mail (letters, periodicals, packages) throughout the country is now being delayed. Eighty-two mail processing plants, half of those remaining, will be closed during 2015, including those in Springfield, Pendleton, and Bend, Oregon. “These cuts will cause hardships for customers – especially the elderly, disabled, rural, and small business customers-- drive away business, and cause irreparable harm to the U. S. Postal Service,” said Rev. Schwiebert, a leader of Portland Communities and Postal Workers United. He called the changes part of USPS management’s “flawed” strategy to sacrifice service without addressing the Postal Service’s manufactured debt crisis. 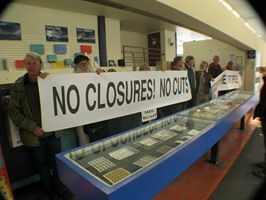 Postal management says these cuts and closures are necessary because the USPS is losing money. Critics claim that a 2006 Congressional mandate, which forces the U.S. Postal Service to prefund retiree health benefits 75 years in advance, has created a phony financial crisis. Although the USPS has claimed a “loss” every year since 2006, due primarily to the pre-fund mandate, the postal service has not made an actual payment toward prefunding since 2011. The U.S. Mail Is Not for Sale! Protest Privatization of Our Post Offices! Staples and the U.S. Postal Service have cut a deal that jeopardizes our nation’s public post offices, the sanctity of the mail and thousands of good jobs at living wages. Staples has contracted with the USPS to staff post offices installed within their stores. In pilot openings last fall, 82 post offices were launched inside Staples stores with low-paid, non-union, non-postal workers (the average Staples worker makes $18,000 per year). If the pilots are “successful”, the USPS plans to open post offices inside every one of the 1,600 Staples stores nationwide, beginning this September. STOP SHOPPING AT STAPLES! Let them know! Get your union, school, employer, church, etc. to stop using Staples! WHO'S POST OFFICE? THE PEOPLE'S POST OFFICE! Sponsors: American Postal Workers Union, National Association of Letter Carriers, National Postal Mail Handlers Union. Endorsers: Communities and Postal Workers United, Jobs with Justice. Postal management has effectively "whipsawed" the unions against each other, reducing the workforce by one-third, dismantling half the mail-processing plants, and contracting out postal trucking, janitorial and mail handling piecemeal. Now, thanks to a new activist APWU leadership, intent on unifying and mobilizing all postal workers, a detailed unity statement has been signed and a unified national day of action declared for April 24. 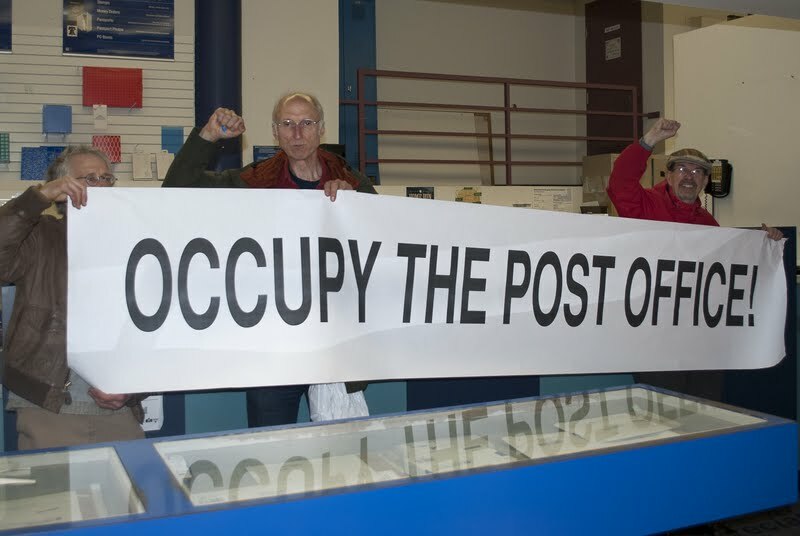 Occupation of Mail Portland Oregon Post Office Attempted! Privatization protest includes birthday party. in Portland Oregon (on NW Hoyt) on Friday afternoon, July 26. Dozens of protesters rallied and attempted to occupy the Main Post Office in Portland Oregon (on NW Hoyt) on Friday afternoon, July 26. The protest against postal privatization was thwarted by a heavy presence of Department of Homeland Security police, Postal Inspectors and a half dozen postal managers standing inside the post office lobby. declared Jamie Partridge. “We are protesting the privatization of the people’s postal service. The demand to end the subcontracting of postal jobs was echoed from a soapbox by the leaders of local postal unions: Joe Cogan, vice president of the American Postal Workers Union local 128, David Jarvis, president of the National Postal Mail Handlers Union local 315, and Jim Cook, president of the National Association of Letter Carriers branch 82. Following the speakers, protesters broke into a rendition of “Happy Birthday” to celebrate the July 26, 1775 establishment of the U.S. Post Office. Benjamin Franklin (played by Tim Flanagan) explained that the post office was founded as a revolutionary act, needed to organize resistance to British tyranny and oppression. At the same time, Portland postal truckers are being put on standby while the low-wage, non-postal, non-union Dill Star Route/ LAPO trucking company takes their work. “This privatization and union-busting is being carried out in the name of a phony financial emergency,” said Rev. John Schwiebert, one of rally speakers. “The security, safety, and timely delivery of the mail are all at risk. Rural communities, seniors and the disabled, small businesses and low-income communities are hit the hardest. Postal management needs to stop and reverse these closures, cuts, and subcontracts which are sending our beloved postal service into a death spiral.” Portland Communities and Postal Workers United (PCPWU) has been fighting cuts and closures to the postal service for the past year. In May of 2012, ten activists were arrested occupying Portland’s University Station post office, which has since been closed. In April of this year, five protesters went to jail for a civil disobedience action at the Salem mail plant, which is now being dismantled with mail processing machines moving to Portland. The same group was arrested this month occupying the Matheson plant and later blockaded a Dill Star Route truck, demanding those companies stop stealing family wage, union postal jobs. Mail sorting machines being moved from Salem cannot fit into the Portland Air Cargo Center, so space is being leased next door in the Matheson facility. But when the SWYB machine is moved into the Matheson space, it will be worked by twelve non-postal mail handlers and six non-postal processing clerks, hired by Matheson. USPS senior plant manager Lisa Shear says the sub-contracting is necessary to save labor costs in this “financial emergency”. The “financial emergency” is phony. Since 2006 the USPS has been forced to spend nearly 10% of its budget pre-funding retiree health benefits 75 years in advance. No other U.S. agency or private business faces such a crushing financial burden. Not only would the postal service have been profitable without the mandate, the USPS has also over-paid tens of billions into two pension funds. In the past year, the Postmaster General has closed 30% of mail processing plants, reduced hours by 25% - 75% in half of post offices, put 10% of post offices up for sale, subcontracted trucking and mail handling, eliminated tens of thousands of family wage, postal jobs and delayed mail delivery. The USPS own studies (revealed at the March 22, 2012 meeting of the Postal Regulatory Commission), showed that big mailers leave the system as a result of such delays, costing more in lost revenue than is saved by lowering labor costs, not to mention the dramatic increase in trucking costs as mail is transported hundreds of extra miles to be sorted in the closest still open facilities. Postal workers have seen their wages cut by 25% for new hires. Bottom-tier Postal Support Employees (truckers and clerks) and Mail Handler Assistants now make less in wages and benefits than the non-postal, non-union sub-contract workers. The postal service is not broke. Subcontracting work is unnecessary and costly. However, the agenda of corporate America, their friends in Congress and in postal management, according to the CPWU, is to cripple the USPS, to soften it up for union busting and privatization. The USPS is a $65 billion annual business with over $100 billion surplus in its pension and retiree health benefit funds, over 30,000 post offices and 200,000 vehicles. Postal activists claim that America is being confronted with a huge transfer of public wealth to for-profit, private corporations. Hot off the press -- the August newsletter of Communities and Postal Workers United! The postal service is not broke. Subcontracting work is unnecessary and costly But the agenda of the 1%, their friends in Congress and postal management, is to cripple the USPS, to soften it up for union busting and privatization. The USPS is a $65 billion annual business with over $100 billion surplus in its pension and retiree health benefit funds, over 30,000 post offices and 200,000 vehicles. We’re facing a huge transfer of public wealth to profiteering private corporations. Ten protesters blocked a private mail truck leaving the Mt. Hood Distribution Center (US Postal Service) today, demanding that postal management stop subcontracting the trucking of “the people’s mail.” Claiming concerns about safety, cost and corruption, the blockaders left after police ordered them to disperse. No arrests were made. Calling themselves “postal protectors,” the ten included retired postal workers, a pastor, a small business person, seniors, a teacher, and a union organizer, all of whom declared themselves impacted by postal privatization. Chanting “We’ll be back!” the protesters vowed to further interfere with private mail transport, if postal management did not reverse the subcontracting. Seven postal trucking positions were recently eliminated at the same time as the subcontractor, Dill Star trucking, hired twenty drivers to do twice as many mail runs as were previously needed, according to Partridge. The company is being paid $59 per hour for each driver, while the USPS is paying for the gas and lending the company postal trailers (in violation of postal rules) and leasing nine tractors for Dill Star use (at $30,000 per month). According to union officials, postal drivers are sitting on standby without work, up to 500 hours a week, while many of the extra Dill Star trucks are running empty or have very little mail. Portland Communities and Postal Workers United (PCPWU), the group behind the protest, has been fighting cuts and closures to the postal service for the past year. In May of 2012, ten activists were arrested occupying Portland’s University Station post office, which has since been closed. In April of this year, five protesters went to jail for a civil disobedience action at the Salem mail plant, which is now being dismantled with mail processing machines moving to Portland. On July 3rd, five “postal protectors” were arrested for occupying Matheson Flight Extenders, a company slated to take over twelve mail handling and six mail processing jobs from union, postal workers. Organizers expect dozens of protesters, some of whom will sit-in at the airport mail facility, demanding that postal management reverse the subcontracting of postal jobs. Portland Communities and Postal Workers United (PCPWU) has been fighting cuts and closures to the postal service for the past year. In May of 2012, ten activists were arrested occupying Portland’s University Station post office, which has since been closed. In April of this year, five protesters went to jail for a civil disobedience action at the Salem mail plant, which is now being dismantled with mail processing machines moving to Portland. Postal mail handlers and processing clerks are losing their jobs in Salem as the work is being subcontracted to the low-wage, non-postal, non-union Matheson corporation in Portland. At the same time, Portland postal truckers are being put on standby while the low-wage, non-postal, non-union Dill Star/ LAPO trucking company takes their work. Mail sorting machines being moved from Salem cannot fit into the Portland Air Cargo Center, so space is being leased next door in the Matheson (Asiana Cargo) facility. But when the SWYB machine is moved into the Matheson space, it will be worked by twelve non-postal mail handlers and six non-postal processing clerks, hired by Matheson. USPS management says the sub-contracting is necessary to save labor costs in this “financial emergency”. No postal truckers have been hired for years, leading to understaffing and excessive overtime. Postal management’s solution is to subcontract approximately twenty trucking routes in the Portland area to a fly-by-night outfit, Dill Star/LAPO trucking. Not only was this a no-bid subcontract, but the company is in bankruptcy, had to lease postal trailers, lease some tractors, and quickly hire off Craig’s List. Meanwhile, approximately fifteen career postal truckers have had their hours drastically reduced and are stuck on stand-by two to six hours a day. In the past year, the Postmaster General has closed 30% of mail processing plants, reduced hours by 25% - 75% in half of post offices, put 30% of post offices up for sale, subcontracted trucking and mail handling, eliminated tens of thousands of family wage, postal jobs and delayed mail delivery. Save the People’s Post Office STAMP – John proposed we create a stamp which could be applied to any envelope (back or front) like the Easter Seal stamps. It could say “Don’t Let Congress Kill the Postal Service” and could include our website (www.cpwunited.com) and create a QR code which could be scanned by smart phones to link directly to our site. John will ask Michael Colvin if he could work on the QR code. Jamie will draft a “stamp” – actually a “stamp-llike” design which could be printed on appropriate size mailing labels. REGULAR MEETINGS SET FOR 1st Wednesday, 8pm (after Occupy St. John’s meeting) at Anna Bananna’s, 8716 N. Lombard in the heart of St. John’s.